LEBANON, Ohio—The sun is setting on this small town in southwest Ohio, and when darkness reigns, strange things happen at the Golden Lamb Inn. Or so I'm told. The Inn, owned by the family of Ohio Sen. Rob Portman for the better part of the last century, is the oldest hotel in the state. Since it opened as a simple lodge in 1803, 12 presidents have visited and scores of notable guests like Charles Dickens and Mark Twain have walked the halls. In that time, at least three guests have died here. Some believe that the spirits of the unlucky trio never left. A prospective vice presidential candidate owns a haunted hotel? Get me a reservation. I reserve a bed on a Monday night, requesting the "Harriet Beecher Stowe" room—a supposedly haunted space where countless ghost hunters have reported signs of paranormal activity. I arrive early that afternoon. The clerk checking me in notes that I'll be sleeping in the haunted room next to a bed full of creepy dolls that one of the ghosts likes to play with at night. She assures me I'll survive. "We haven't had a casualty yet," she says dryly, and hands me my key. She forgot to add, of course, "recently." The Golden Lamb sits in historic Lebanon, a charming town between Cincinnati and Columbus. Entering the city limits, visitors pass fields of corn and stately homes with wide, manicured lawns. The hotel is downtown, surrounded by local shops that resemble the Main Street of 50 years ago more than the deserted city centers spanning much of the country today. Despite the charm of the place, ghost stories abound. Guests at the inn have encountered a young girl wearing a white nightgown who vanishes as quickly as she appears. Some think the mysterious figure is the daughter of nineteenth-century lawmaker Henry Clay named Eliza, who died of fever inside the hotel walls. 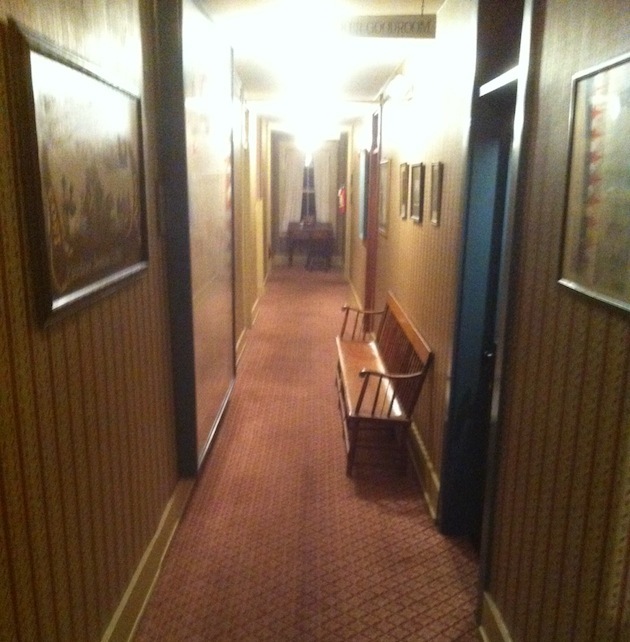 Others say it is the ghost of another child, Sarah Stubbs, who grew up in the hotel. Her room was at the top of the staircase on the fourth floor (the same room I'm staying in), but when she was forced into a different room she was furious and has since returned to haunt her childhood home. 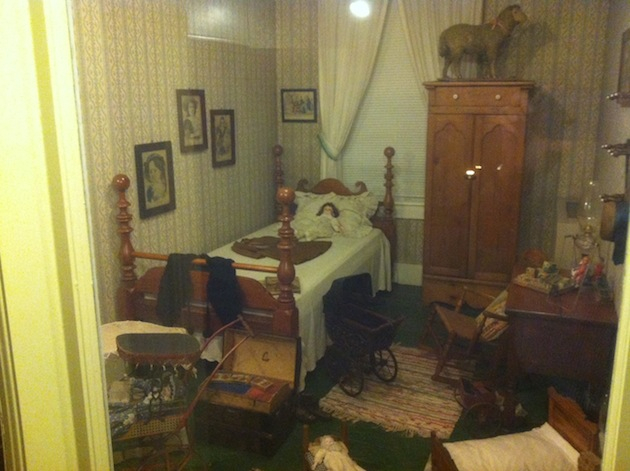 In the room next to hers, hotel staff have replaced the door with a glass casing and decorated the space with terrifying antique toys: A doll is sprawled out on the single bed; a rocking horse rests in the corner near a black baby carriage; a stuffed lamb sits atop an armoire. "The restless spirit of a young girl materializes in this small room," an inscription reads outside the door. Downstairs, on the second floor, a former congressman named Clement L. Vallandigham accidentally shot himself in 1851, and people claim to have seen his shadow pacing the room—now a private dining space for guests of the restaurant. Two decades earlier, Ohio Supreme Court Justice Charles Sherman also perished in the hotel, and guests have reported seeing the spirit of a thin man walking the stairs between the lobby and the rooms. Walking up the stairs toward my room, I pass rows of antiques on each floor, including an old child's tricycle, hundreds of sheep ornaments and walls covered in fading flower patterned paper. When Rob Portman's grandfather bought the hotel in 1926, he filled the place with Shaker furniture, giving it that nineteenth-century vibe—perfect for a historic building thought to be haunted. I pass a busy maid, who immediately spots my voice recorder and notepad. "Are you a ghost hunter?" she asks me, and offers a word of caution. "The doors to the TV case pop open all the time and it's not the latch," she warns. "Because I've had the maintenance man check the latch." The phone in the haunted room doesn't work either—rarely does—and yes, the maintenance guy has checked that too. I'll be mostly alone all night. There are only a few people staying in the entire hotel, including one person with me on the haunted floor who will be sleeping in "The Ronald Reagan Room" at the far end of a long hallway straight out of The Shining. Before my trip, I spoke to ghost enthusiasts for tips on what to expect. I found Chris Woodyard, author of a series of books called Haunted Ohio, who appears to be the foremost expert on paranormal activity in the Buckeye State. Her main advice: Shut up and listen. "I strongly discourage people from trying to deliberately communicate, but if you want to be open to her, that's fine," Woodyard told me when I asked about hearing from the girl's ghost. "If a ghost wants to talk to you, it will. You've probably seen these guys on TV shouting and taunting. That's just silly...If you believe there's actually a person there, then that's just plain rude." It's helpful advice, because I was probably just going to shout aimlessly into the darkness until I scared myself anyway. Before the sky darkens, I settle into a table at the hotel restaurant, prepared to quiz the staff about their own experiences with the haunts of the Golden Lamb. My waitress shows me a hand with a nasty scar that stretches across three fingers, which were sliced open when a porcelain sink collapsed on her in the basement. She had just finished telling her colleagues about how all the ghost talk was hogwash when the sink came crashing down. Now she's a believer. And she keeps her distance. "I won't go upstairs, I won't go downstairs, I won't go in the tunnels, nothing," she says. "No, thank you. Everybody knows, they don't ask me any more because I'm not going." By the end of my stay, I met three staff members who refused to venture to the top floor. After dinner, De-De Bailey, the assistant general manager who has worked at the hotel for 35 years and who describes herself as "the largest skeptic" in the building, joined me for coffee to prepare me for the night ahead. She had her own unexplainable brush with the underworld when she was alone in one of the dining rooms a few years ago. Bailey swears she heard someone sigh behind her, but turned around to find no one there. Later that night, 40 glasses were destroyed when they suddenly fell from the cupboard and crashed onto the ground. "I can't explain that one," she said. I'm alone, and it's past midnight on the top floor of the Golden Lamb. The handful of guests staying overnight have retired to bed. The night auditor sits by himself downstairs listening to piano music from the kitchen. Suddenly, the peace is broken by the sudden sound of Thump! Thump! Thump! above my head. It stops for a moment and then starts again. I had heard stories of past guests saying they hear footsteps in the same room. This must be it. I'm on the top floor of the hotel, but it sounds like someone is stomping around directly above me through the ceiling. Then, it stops, and I wait for it to pick up again. But it's over. The only sound I hear now is the steady hum of an air conditioner and the soft ticking of my watch. I turn on my voice recorder. Taking a cue from the ghost hunting shows on TV, I try to build up the courage to verbally invite one of the ghosts to talk to me. "Are you there, ghost?" I clumsily mutter into the darkness. Earlier, I had watched YouTube videos of paranormal enthusiasts in the exact same spot I am now, saying much of the exact same things. They claimed that the spirits responded, but I don't hear anything now. "What's your name?" I say. "Would you like to talk?" The mere sound of my own voice startles me enough to regret saying a word. I start to feel ridiculous and after more than an hour of sitting quietly, I give up. Feeling both disappointed and relieved that the ghosts left me alone, I head to bed. The next day, I caught up with Portman to ask him about his own experience with the supernatural at his family's hotel. I told him about the thumping above the fourth floor. Does he believe? "I have not seen the ghosts," he told me. "But my mom used to tell stories about hearing the chains at night of the ghosts walking down the hall." With a twinkle in his eye, he smiled and added: "You never know."